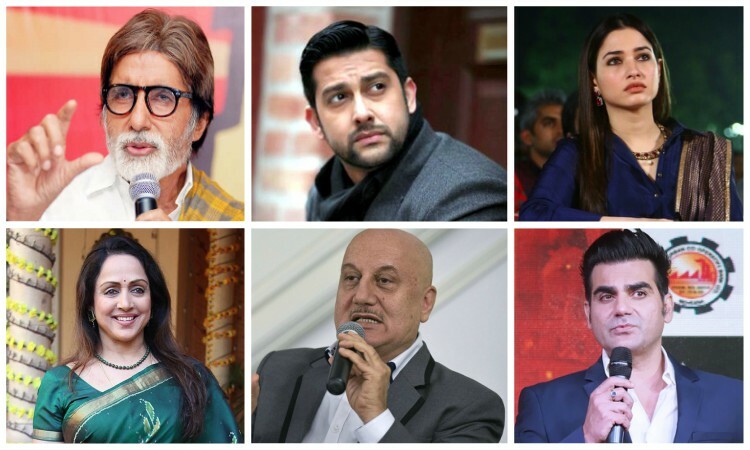 Bollywood celebrities including Amitabh Bachchan, Anupam Kher, and Hansal Mehta among others have expressed their sadness over the collapse of a portion of an overhead pedestrian bridge outside the Chhatrapati Shivaji Maharaj Terminus here. Six people have been reported dead and 32 injured after the footbridge crashed on Thursday evening. Amitabh Bachchan: In grief and in silent prayer! Mumbai city. Hema Malini: Tragedy, this time in the heart of Mumbai! The foot over bridge at the CST suddenly collapsed... I pray for those who have lost their lives and for those now in the hospital for treatment. Anupam Kher: Deeply saddened to know about the bridge collapse in Mumbai. My thought and prayers are with the bereaved families. May God give them strength to deal with this loss. Varun Grover: Every such act of negligence by the government should be counted as state-sponsored murder of its citizens. Makes one feel so angry and helpless. We use the local train and these stations daily and it's impossible now to not feel paranoid. Shame. Mumbai bridge collapse. Hansal Mehta: Now the CST over bridge collapses. This city is collapsing and nobody really cares. This city is no place for human beings. Aftab Shivdasani: Really sad and tragic news of the Mumbai bridge collapse... Sincere condolences to the families of the deceased and hope the injured recover soon. Wish the authorities would pay more attention to civilian safety. Innocent lives wouldn't be lost Mumbaikar. Arbaaz Khan: Mumbai bridge collapse... Extremely saddened by the bridge collapse incident at CST. Tragic and unnecessary loss of innocent lives. Prayers with the victims and injured and heartfelt condolences to their families. Tamannaah Bhatia: Truly saddened to hear about the horrid news of Mumbai bridge collapse. My condolences to the families of the bereaved and wish for a speedy recovery for those injured.